Last Sunday, Mommy Jane brought 2 Little Angels to attend My Mom My Idol event organised by Ms Jazzmine Cheah at Shangri-la Hotel. 12 pairs of mothers and their daughters had attended the program for a bonding session include Mommy Jane with my 2 beautiful daughters, CM and CW. Mommy Jane reached the event place at 10 a.m. and there are mothers and daughters who dress-up nicely. The pretty little girls manage the registration counter and become the usherer on that day while their Mommies were busy arrange the event for us. Once registered, we were presented with 2 goodie bags. 1 for Mommy Jane and another 1 for my daughter. My 2 Little Angels were ushered to sit at a table with other children for their art and craft activities. They are going to made cards for Mommy and Paint-My-Heart canvas bag making guided by the staff from KidzatWork Bkt Jalil. While the kids were busy with their artworks, all the pretty Mommies had fun time making a nice bracelets as rewards for ourselves for being the Best Mommies to our Little Angels. The beautiful and elegant bracelet was sponsored by Angie Ng from Elegant Jewellery Studio and her staff taught us on how to make our own jewellery. After making our bracelet, Mommies were consult by Jazzmine Cheah on the basic ideas of styling ourselves to have a visual outlook and personal image. She showed to us the comparison for the personal best colour palette that suits us well. For Mommy Jane, I need to wear those striking colour and not to wear too dark colour to suit my image. Jazzmine Cheah is the organiser for My Mom My Idol event. She is also the founder and master trainer for Beyoutiful Image & Style Consulting. She believes that our image is the reflection of our confidence and personality and she is there to help us to create our personal image that reflects "Beauty With A Purpose". Jazzmine conducted programs that is suitable for women who is looking for holistic image transformation. 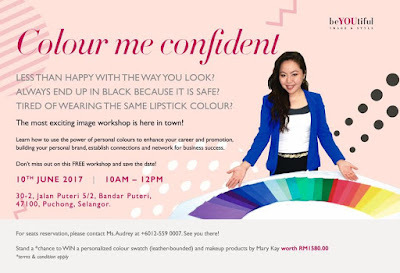 She can be contacted at 012-5590007 or email to her at info@imageatwork.com.my. Jazzmine will have a complimentary Colour Workshop on next Saturday on the 10th June from 10 a.m. to 12 p.m. She will share the latest colour drapes and the latest addition by AIM ColourSmart. If you've always wondered what colours best suits your personality and colour that works its magic to create an impactful image, do call her up at 012-5590007 for reservations. No walk-ins will be allowed as this is a closed-door session. Stand a chance to Win Your Colour Swatch worth RM200 each and there are 3 Swatches up for grab and beauty products from Mary Kay worth RM1,580. Wow !!! As for lunch, we were served with 3-course meal i.e. Appetiser, Main Course and Dessert. Me and my daughters' meal were different. 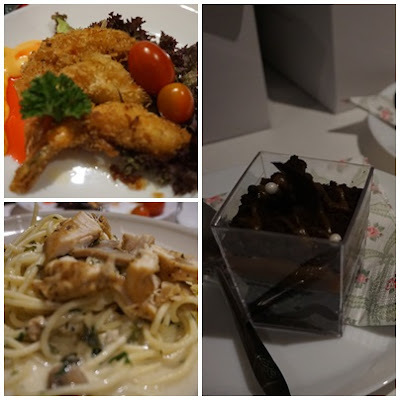 For all the children, they had fried prawn as Appetiser, Carbonara Spaghetti as Main Course and Chocolate Trifle as dessert. 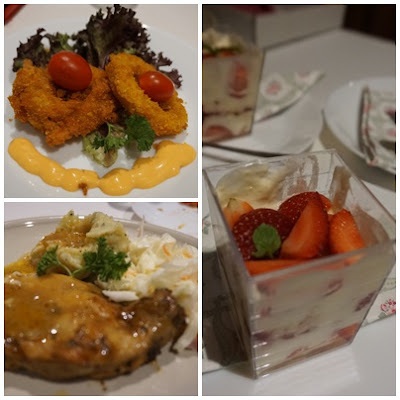 For all the Mommies, we had fried squid as Appetiser, Chicken Grilled with Colleslaw and Mashed Potatoes as Main Course and Strawberry Trifle as Appetiser. After our delicious meal, we had the last activity with daughter-dressing-up mother competition. Jazzmine had briefed the children before all Moms were blind-folded and children got to dress-up their Mommies with the dress, scarf, accessories etc. Children had fun time while Mommies not sure what will be happen after the dressing but when we lift up the cloth, miracle do happen. Children were indeed creative and had dressed up their Mom perfectly. Thanks to Jazzmine Cheah for inviting Mommy Jane and 2 Little Angels to joined the awesome My Mom My Idol event. We truly had enjoyed ourselves so much. Everything was well-planned and we had a wonderful time meeting with new friends and joining all the activities prepared for us. Thanks for the beautiful flowers, the beautiful crystal crown, the beautiful bracelet by Angie, the lovely headbands by Shentel Lee, founder of Sereni & Shentel, the art & craft by Cydney, beauty products, Hello Kitty pencil case, Isetan and MPH cash vouchers. Thanks to all the sporting Mommies and lovely Girls who had attended the event and hope to see all of you again soon. 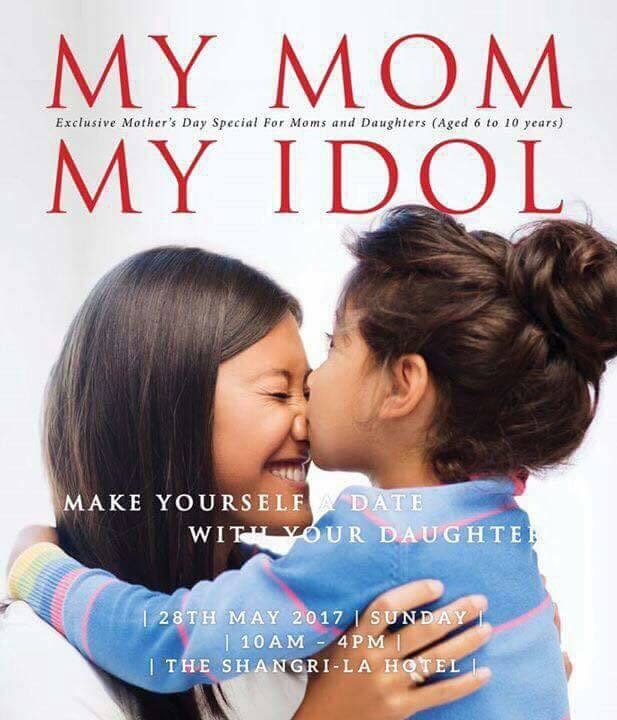 This is such a meaningful event, bonding between mother & children, yet not to forget to remind that all mums are beautiful. Pui Yee, agreed with you after all the sacrifice Moms did for all of us. So much for both mummy and daughter had. I loved that both had an opportunity to go hands on making craft. What a rare opportunity. Wow such a great event and all the mamas get to go back with the bracelet. Kelly, indeed a nice bracelet we had. Dr Life, definitely agreed with you. Jazzmine is a friendly person too. Bella, everything was well-organised and all participants had enjoyed it so much. Look like a lots of fun there . I'm jealous , we don't have children yet . I can imagine if my wife and the kids is there but unfortunately we don't have one . Galih, thanks for your support. It might be useful to you one day. Kelly, indeed it is. We really love it. Yana, we hope it too so that more Mommies and daughters could enjoy it.